When it comes to internet search, Google is the only choice for many of us. But do you know beside "search", Google has lots of services that cover aspects of everything from online payment services to mobile applications. 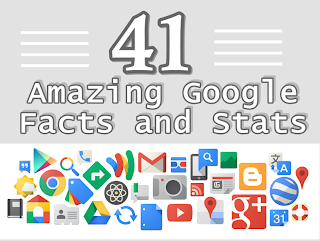 So to encompass Google empire and it's big arms the wishpond team has collected up 41 latest facts and statistics in this infographic to show you how much it has grown. The King of domain Google.com was registered on September 1997. Google launched AdWords program on 23 October, 2000. Google launched it's Admob service on 27 May, 2010. Google started DoubleClick on 13 April, 2007. Google purchased the world's largest video search engine YouTube on 13 November, 2006. G-mail launched by Google on 1 April, 2004. The 2nd biggest social network Google Plus was launched by Google on 28 June, 2011. King of browsers Google chrome was launched on 2 September, 2008. Google released it's first android-based phone on September 2008. In June 2013 total number of monthly Google searches was 12.8 billion. In June 2013 the shares of Google in US search market was 66.7%. Total number of monthly unique visitors to Google sites are 192 million. There are more than 1 million AdWords advertisers. There are more than 2 million Adsense Publishers. The total amount earned by Adsense publishers in 2012 was 7 billion. There are 300000 applications that serving Google mobile ads. In march 2013 the total number of video applications served on Google was 2.3 billion. There are 15 million websites utilizing Google analytics on their web pages. There are 10 million people worldwide who use Google drive. There are more than 425 million G-mail users. Google plus has exceeded the 343 million monthly active users. More than 20 million people use Google+ on mobile device. In march 2013 the average monthly time spend on Google plus by a user: 6 minutes and 47 seconds. The number of Google Chrome users in the world are 750 million. The total number of employees that working in Google are 53,891. There are a million android applications in Play Store. There are 900 plus million android devices in the globe. Total number of android application installs are 48 billion. The total number of YouTube monthly active users (worldwide) are 1 billion. 100 hours of videos are uploaded on YouTube after every minute. Total number of videos watched on YouTube in 2011 are 1 Trillion. 6 million hours of videos watched on YouTube on monthly basis.